Protects wounds, open sores, scratches and abrasions from dirt, filth and disease-carrying flies. 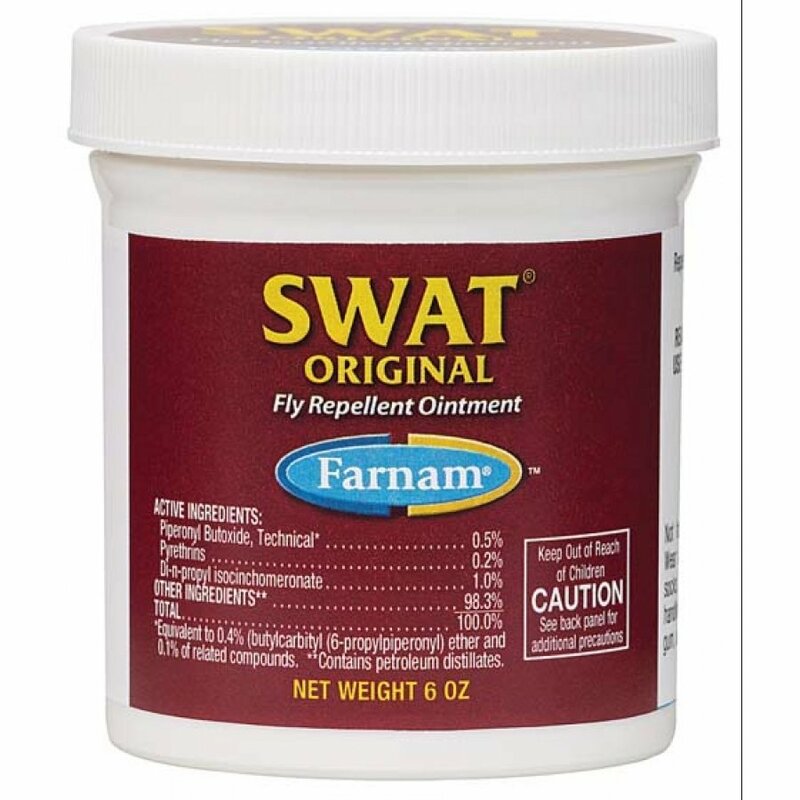 Botanically-derived pyrethrin formula repels house flies, stable flies, face flies and horn flies, and kills them on contact. Used on horses. 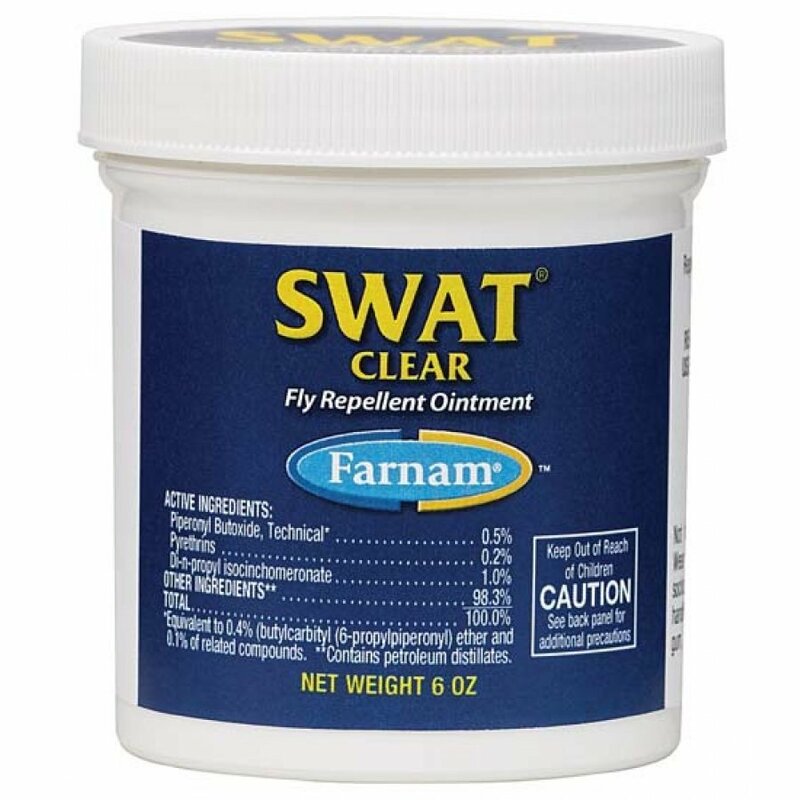 Swat Fly Repellent Ointment 6 oz. has different options and/or variations, please choose below. Made in the usaActive Ingredients: Piperonyl Butoxide, Technical*-0.5%//Pyre- Thrins I & Ii-0.2%//Propylisocinchomeronate-1.0%//Inert Ingredients-98.3%//*=equivalent To 0.4% (Butycarbityl)(6-Propylpiper- Onyl) Ether And 0.1% Related Compounds. Made in the usaActive Ingredients: Piperonyl Butoxide, Technical*-0.5%//Pyre- Thrins I & Ii-0.2%//Propylisocinchomeronate-1.0%//Inert Ingredi-Ents-98.3%//*=equivalent To 0.4% (Butycarbityl)(6-Propylpiper-Onyl)ether And 0.1% Related Compounds.